Dr. Kit Miyamoto with US Ambassador to Nepal HE Alaina B. Teplitz at Gaddi Baithak. Sep 17, 2017-Apart from the occasional articles in newspapers and the seminars conducted by international agencies and non-governmental organisations in Kathmandu, nobody was seriously aware of the danger of earthquakes looming around Nepal until April 25, 2015. The devastating earthquake of magnitude 7.8 resulted in the death of 9,000 people, seriously injuring 22,000, causing the collapse of 500,000 homes and leaving 250,000 houses damaged. This great earthquake also caused the collapse and widespread damage of ancient monuments in earthquake affected areas of Nepal. According to a study conducted by UNDP, 8 million people were affected by the earthquake. One of the world’s leading earthquake specialists, Kit Miyamoto, who is also the founder of the USA-based earthquake engineering and risk assessment firm, Miyamoto International, was in Kathmandu two days after the earthquake. One of the first things he did was to conduct quick damage assessments of several historical monuments in Kathmandu. With his team of engineers, Miyamoto assessed more than 1,000 structures. In time, he and his team were also hired to assess the Everest and Annapurna trails to help open these tourist routes while also putting together teams to repair and strengthen dozens of key structures. Growing up in highly seismic Japan and earning a degree from California State University and PhD from Tokyo Tech, Kit Miyamoto witnessed his first major earthquake disaster in California in 1994 and thought engineers should do more to prevent such disasters. In 2008, he led a research mission to China to assess damage to thousands of buildings destroyed during a magnitude-7.9 earthquake that struck the mountainous Sichuan province, killing 70,000 people and leaving over 18,000 missing. Since then, he has become a California Seismic Safety Commissioner and is the recipient of the National Council of Structural Engineers Association’s Excellence in Structural Engineering Award, ENR Best Global Projects Award (three times) and ASCE Humanitarian Award. He is also a fellow in the American Society of Civil Engineers. Upon arriving in Nepal, Miyamoto started a non-profit organisation, Miyamoto Relief Nepal, to help safeguard schools and legendary historical monuments. The organisation is working in tandem with the custodians of Nepal’s heritage, such as the Department of Archaeology, Government of Nepal. Upon his arrival in Kathmandu on the third day after the big earthquake, Miyamoto went to Kathmandu Durbar Square to conduct a rapid damage assessment of earthquake damage to the historical structures in this UNESCO World Heritage Site. During his preliminary visual assessment of the entire Hanumandhoka monument zone, his attention was drawn to Gaddi Baithak, a 19th century historical neoclassical structure. This European-style building was built as a part of the palace in the early 20th century by Rana Prime Minister Chandra Shamsher during the reign of King Prithvi Bir Bikram Shah. Gaddi Baithak is a prominent historic buildings inside the Hanumandhoka World Heritage complex and it carries outstanding universal value. Although Chandra Shamsher had the palace built for residential use by kings, by the time of King Mahendra Shah, the palace had become a centre from which kings ruled and settled the affairs of the country. The Gaddi Baithak has witnessed numerous royal functions and ceremonies over the years. Ambassadors from foreign countries used to present their credentials to the kings at this Baithak. Kings used to visit Gaddi Baithaik on the day of Kumari Jatra, or the festival of the living goddess, and witness the ceremony of the chariot of Kumari from the balcony of the Gaddi Baithak. Even after the political change, in modern-day Nepal, the President and the Prime Minister, as heads of the constitutional bodies grace this age-old cultural event. Besides the Hanumandhoka complex, Miyamoto conducted damage assessments of all major historical monuments in the Valley, including the 19th century Rana palaces with the objective of saving these earthquake-damaged buildings from being completely demolished. He attended several meetings with government authorities in this regard such as the National Reconstruction Authority, Department of Archaeology, Ministry of Education, etc. It was in such meetings that Miyamoto raised his voice against the decision of demolishing the Singhadurbar, another landmark neoclassical historical building of Kathmandu. 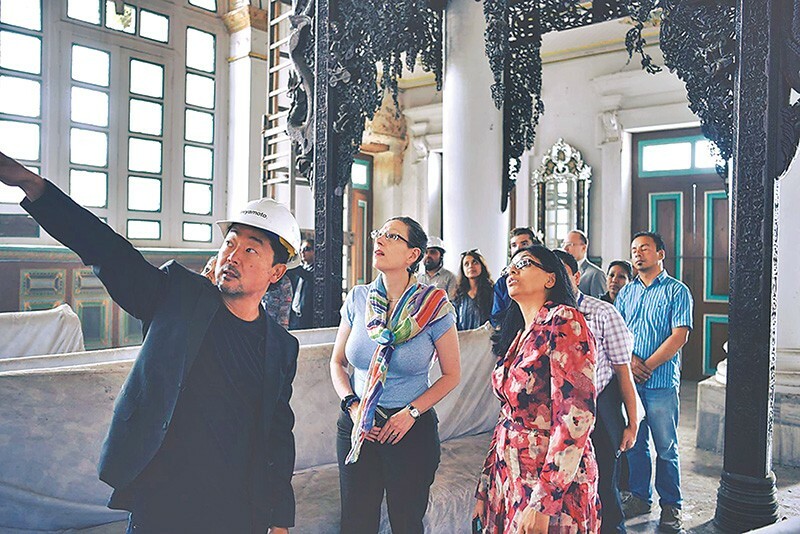 The Miyamoto team had several interactions with the prominent Rana families of Kathmandu, motivating them and seeking their support to save the neoclassical Rana-period buildings from being demolished due to the damage caused by the earthquake. The Miyamoto team also organised meetings between Rana families and the concerned government authorities, managing to convince them that these building can be retrofitted. These efforts led to the common consensus to retrofit these old palace structures and some of them are undergoing a detailed technical design process, which is much more cost-effective than tearing down and rebuilding. Miyamoto approached the appropriate government authorities for permission to take up detailed study towards the restoration of various other historical monuments of Kathmandu Valley, such as the Rani Pokhari, the main front structure of the Singha Durbar, the Gaddi Baithak, National Museum, Kaiser Mahal, Babar Mahal and so on. Miyamoto Relief was formally authorised to restore the Gaddi Baithak under funding from the US Ambassador’s Fund for Cultural Preservation, Large Grant Program. After completion of the detail damage assessment and technical design, actual repair work has started based on the elaborate technical report prepared by the experts. Detailed survey work, damage assessment, damage mapping and creating working drawings have been conducted in regards to the Gaddi Baithak. This has been done with the objective that the building, with such historic and cultural value, should survive similar earthquake disasters in the future.